New home construction starts in 2012 reached their highest level since 2008, but remain way below long-term normal levels. Raleigh, Austin, and Houston led the U.S. in construction activity. Construction is still at historically very low levels, even after the 2012 “rebound”. Average housing starts over the period 1990-2011 were almost 1.4 million. At 780 thousand, 2012 construction starts were 43% below this long-term average. Aside from the even-worse years of 2009-2011, construction starts in 2012 were at their lowest level since 1959, when the Census began reporting housing starts. A marked shift toward multi-unit buildings. In 2012, 31% of new home starts were in multi-unit buildings, as opposed to single family homes. That’s the highest share in the last twenty years, during which multi-unit buildings have accounted for just 20% of new home starts, on average. Strong rental demand, as well as overbuilding in some sprawling single-family neighborhoods during the boom, has pushed developers to focus more on multi-unit construction. New construction started in 2012 isn’t being completed quickly. Single-family homes typically take around four months from start to completion; multi-unit buildings take a little over a year. New home completions were only 11% higher in 2012 than in 2011 – a smaller increase than the 28% increase in starts. That means many of the homes started in 2012 won’t be completed until 2013 (even though new homes are often sold before they’re completed). It has been a jobless construction rebound. Despite the 28% increase in construction starts between 2011 and 2012, residential construction jobs actually fell 1.2% between December 2011 and December 2012 (though there was a slight uptick at the very end of 2012). Construction jobs are down 23% since December 2008, when construction starts were running at close to the 2012 level. And construction employment is down 45% from its peak in April 2006, at the height of the construction boom. Construction is sprinting ahead in some metros and struggling in others. Based on local permit data through November, the latest available, Raleigh, NC had the highest rate of construction activity in 2012. With 25.6 new building permits per 1,000 housing units. The three Texas metro areas of Austin, Houston and Dallas were also among the top 10 markets for construction activity. None of the top construction markets are in the Northeast or Midwest. Nationally, construction starts were 43% below normal levels in 2012. But in a few metros, permitting activity in 2012 was ahead of the metro’s own historical normal over the years 1990-2011. Construction in Austin in 2012 was 33% above normal; Raleigh, Houston and Oklahoma City also have above-average construction activity. In the San Francisco metro area, 2012 permits were 39% above the local historical normal – highest in the country — but normal construction activity in San Francisco is a lot lower than in Houston and other fast-growing metros. 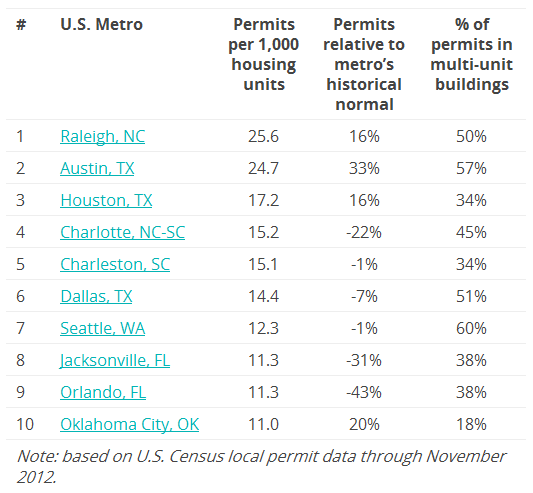 Most permits were in multi-unit buildings in Seattle (60%) and Austin (57%). But multi-unit buildings accounted for the highest share of construction activity in New York (91%) and San Francisco (90%). Surprisingly, the majority of construction activity in Los Angeles (76%), San Diego (63%), and Orange County (61%) was in multi-unit buildings, despite southern California’s reputation for sprawl. What explains these local differences in construction activity? These top markets for 2012 construction tend to have strong job growth and low vacancy rates, and they suffered relatively little during the housing bust. In contrast, construction in Phoenix and Las Vegas – the two markets with the biggest price gains in 2012–is running at less than half the local historical normal. In 2012, builders bet on the markets with healthy market fundamentals that avoided the boom-and-bust – not the markets where prices were rebounding.